SEO (Search Engine Optimization) is careful placement, wording and analysis of keywords/text for optimum search engine ranking. Not only can we help you create your social media accounts, but we can also design them and help you with custom, timed posts for Facebook, Twitter & more. We specialize in maximizing your SEM (Search Engine Marketing) budget for Google AdWords, display ads, etc. to produce a high ROI (Return on Investment). Apps are dominating the mobile market for both iPhones & Android devices. Our development team is well versed in building new apps & mobile optimization. Blogs are a great way to keep your customers informed. We can design and develop custom blogs for your company’s website. Custom events calendars for your company that can work with popular calendar services such as Google that are easy to manage and update. From designing and developing mobile and responsive versions of websites to creating new, custom iPhone apps, we handle it all. We offer custom designed photo galleries to beautifully display important photos of your business, informing future guests of your accommodations. With Google Map Integration, guests can easily locate your hotel to plan their visit from their computer, tablet or phone with ease. Online shopping is at an all-time high and is more so with each passing year, therefore making the ability to reserve hotels online even more necessary. Contact forms are great ways to maintain customer interaction, making it easy for consumers to contact you directly from your website versus emailing. 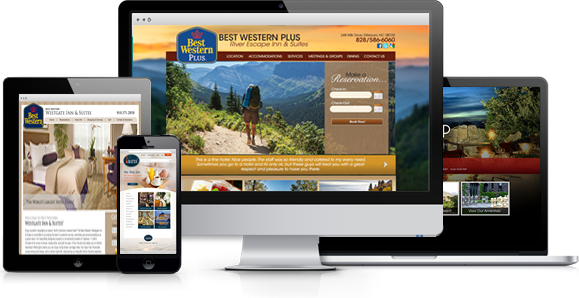 Slideshow integration is a great way to grab customer’s attention when they visit your website and really showcase your best features and amenities. We offer dedicated Webmasters for all of our clients. They will oversee all of your websites needs after it’s live and help with maintenance and monthly upkeep. Your website comes with a number of email accounts, and our dedicated support staff can help you set them up on any device. Our project management staff will help to select and purchase the perfect domain for your company, if needed, as well as register it for you. We make sure that each of our clients get the most out of their money and time with us by not charging extra each time a minor change is needed. After the design and development of your website is complete, we’ll train members of your company to use our admin section for minor changes/updates. We understand that you may sometimes encounter problems outside of your expertise which is why we offer phone, live chat, and 24/7 email support.